In 2013, Nathan Horne and Joey Feith got together for the first time to shoot the breeze about PhysEd, health, and technology. The result was The #PhysEd Podcast. Subscribe to hear why thousands of teachers enjoy listening in on their conversations. Joey & Nathan get the band back together to discuss what’s happening in their schools, the recent ConnectedPE conference in Dubai & Student Leadership opportunities. This is a special live edition from the 2015 National PE Institute in Asheville, North Carolina. In this episode, Joey and Nathan chat about an amazing conference and meet up with a number of special guests! LIVE from #ECISPE in Munich! LIVE from the Hemmingway Bar at the ECIS PE Conference in Munich, Germany. In this very special edition of the podcast, Joey & Nathan discuss all the action of the ECIS PE Conference and includes our first ever podcast guests. In Episode 13, Joey & Nathan talk about weddings, being busy at school, awesome conferences, the future of professional development, the importance of advocacy, and what “raising the bar” actually means. In Episode 12, Joey & Nathan catch up after a busy couple of months of conferences and back to school. They also discuss Phase 2 of the #PhysEd revolution. While both enjoying their summer in Canada, Joey & Nathan take a break for Episode #011 and share some exciting new beginnings while catching up on all that is happening in #PhysEd. 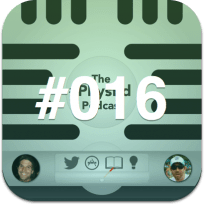 Joey & Nathan celebrate the 10th Episode with a special edition of The #PhysEd Podcast by chatting about data, wellness and sharing their Top 10 Apps, Websites and Tweeters. In episode #009 of The #PhysEd Podcast, Joey & Nathan discuss Joey’s Shorty Awards run, Nathan’s Google Apps student portfolios, and advocacy in #PhysEd. Thank you in advance for rating the show on iTunes! In this special Christmas episode of The #PhysEd Podcast, Joey & Nathan discuss Nathan’s recent #SportEd unit, Joey’s Purposeful #PhysEd as well as the automagical power of Google Scripts. Plus much much more! After a brief hiatus, Joey & Nathan are back with a new episode of The #PhysEd Podcast. In Episode 7 they catch up on the last 6 months of teaching and technology in #PhysEd. In episode #006, Joey and Nathan talk about the end of their school years, how they are spending their summer vacations, The #PhysEd Awards, and their friendly UP competition. In Episode 5, Joey and Nathan discuss topics such as the importance of being a role model to our students, the never ending use of Google Forms, and the effects of the #physed community. In Episode 4, Joey and Nathan cover topics ranging from non-traditional #physed activities, to the PE community hashtags, to where they will be speaking on #physed topics, to Google Chrome extensions, to sugar free diets. In Episode 3, Joey and Nathan cover topics ranging from Google apps for education, teachers who love Twitter, and ways to get your students active in the community. Check out the show notes below! In Episode 2, Joey and Nathan discuss everything from using social media for professional development, to how they get things done, to using Evernote in #physed. Also, they share updates and resources from ThePhysicalEducator.com and iPhys-Ed.com. In this first episode, Joey and Nathan introduce The #PhysEd Podcast, share some news from ThePhysicalEducator.com and iPhys-Ed.com, and talk about PE apps, teachers, and resources.